The B&B is a blend of old world style and modern amenities. Innkeepers Len and Gloria Friedman have a keen eye for detail, offering up welcome drinks each night and providing a rather regal style breakfast. 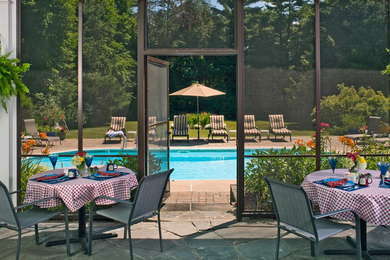 Rooms are cheerful and spacious, many of which have private patios, offering a quiet, New England getaway. Four of the king suites offer private, furnished outdoor spaces; ask about options when you book your stay. Each room has a unique bathroom, but all are modestly modern with period touches. One room boasts a large steam shower, while another has a spacious soaking tub. The formal sitting room with Queen Anne sofas and a formidable piano make for a cozy gathering space. A wine and cheese service is offered in the lobby each afternoon. Breakfast is included and served in the formal dining room, and in summer months, also on the screened porch. Don't be fooled by setup--each table is set with crystal, Wedgewood china and candles--but the service is cheerful and the innkeepers keep it informal. Special dietary needs are no problem, just let them know ahead of time. Expect to find several gluten-free options at each breakfast. Evening cognac and chocolate is served in the lobby. While there is no on-site bar, the owners can chill a bottle of wine for you in the guest pantry. A car is required to maneuver through the adjacent towns in the Berkshires, however, there are restaurants and shops within walking distance of the inn. 51 Park Restaurant + Tavern (3-minute drive) is a cozy New England find with wood-fired pizzas, appetizers to share and comfort food favorite entrees. Choose from a long list of craft beers. For afternoon snacks like housemade cookies and pastries, coffee, or a light lunch, the Starving Artist Creperie (3-minute drive) is a favorite with locals. There's free WiFi, too. For dinner and drinks, Chez Nous Bistro (4-minute drive) offers elegant dishes such as homemade pate, rack of lamb, and scallop risotto in a comfortable, yet unfussy setting. Sip wine by the glass or order a bottle from the long list at Alta wine bar and restaurant (10-minute drive). Firefly Gastropub (10-minute drive) has an impressive selection of beers including local craft brews and imports. There's also a large wine menu and tapas-style snacks. While the inn is conveniently located near Main St., the grounds offer a peaceful retreat. Lounge on the porch or take a nap in the sun on one of the hammocks.